Despite a snowy start to the day, attendees were not deterred from arriving in Glasgow, to break records for the highest number of registrations at the ACM SIGIR Conference on Human Information Interaction and Retrieval (CHIIR), totalling 165 people. As a fairly new PhD student native to Glasgow, I was eagerly excited to attend my first conference and meet so many people from over 25 countries around the world. From day 1, it was clear that people who had travelled from afar were not just distant colleagues, but instead viewed each other as an extended academic family. Academically, the conference comprised of informative tutorials, a doctoral consortium, keynote speakers, paper sessions (full papers, short papers, and perspective papers), practitioner talks, poster exhibitions, workshops, demonstrations, and discussions about the future of CHIIR. The paper sessions (topics) were: Conversation; In & out of the library; Search as learning; Special information needs; Information interests and needs; Search in context; Search interactions; and Search for Health. Being one of 23 student volunteers, I cannot give a thorough review of every aspect that comprised the CHIIR programme. 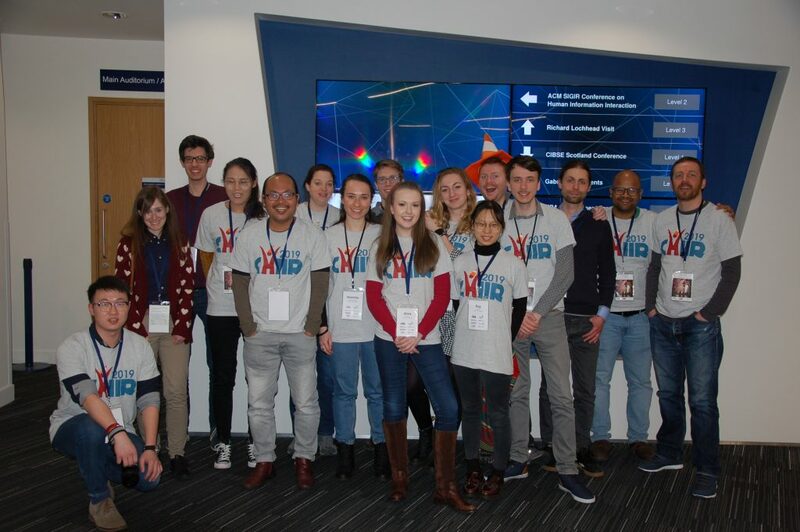 However, having such a large number of volunteers did appear hugely beneficial to ensure that everyone had a fair balance of duties and conference time. Therefore, instead of a list of activities and sessions undertaken, I have chosen to document some of the main points and things I have learned from CHIIR. For full details about what was accepted into CHIIR 2019, and who the programme chairs and coordinators were, please see the following links: http://sigir.org/chiir2019/accepted.html and https://dl.acm.org/citation.cfm?id=3295750 . “The social energy and momentum at conferences can be quite invigorating”. And that’s when it hit me­- People do not just come to conferences to disseminate their work: they come to build a network. It is through sharing work with others that inspires consideration of alternative research questions and methodology, and ignites the research cycle to continue. This point was clarified when I would notice researchers talking to each other who have co-authored many papers together, despite living in opposite sides of the world. Therefore, the social aspect of CHIIR was hugely important. By providing a dinner and games night for all students on the first day, this gave the new attendees the perfect opportunity to meet each other in an informal environment, and paved the way for connections to grow throughout the week. Secondly, a drinks reception was held in the ornate Glasgow City Chambers, and hosted by a Glasgow City Council representative who warmly welcomed everyone to Glasgow – the city famous for its friendliness. Finally, we were lucky enough to gain private access to the Glasgow Science Centre, where champagne circulated the exhibitions, followed by a banquet (that included the finest Scottish smoked salmon and whisky! ), and an awards ceremony gave credit to the best work. Although the evenings ran into the ‘wee small hours’, people’s dedication to science remained, and the conference auditorium continued to reach high attendance even at 9am starts. When some days included up to nine 30-minute presentations, I was at first sceptical that many would not be relevant to me personally. Yet, I learned the valuable lesson not to judge a presentation by its title. For example, one paper focused on participants from Alcoholics Anonymous, an area completely unrelated to my own research. However, they started talking about the “information overload” that occurs when recovering alcoholics try to navigate websites that present information in different formats and the trust involved that the websites are giving the correct information (https://dl.acm.org/citation.cfm?id=3298933 ). Personally, I want to focus on agent-human collaboration in high pressured information environments, and so the solution these authors proposed to improve information retrieval in this area suddenly inspired my own thoughts. Thus, the moral of the story is: even when things don’t immediately seem appropriate, it is still worthwhile investing your time in them, as you never know what key bits will pop out and bring a different slant on overlapping with your own work. Firstly, Dr Ranjitha Kumar (University of Illinois) provided an insightful keynote presentation on Data-driven design. Her work uses machine learning to design effective user experiences in fashion. As a young female myself, hearing another young computer scientist highlighting the bias in user perception that the product concept of femininity is associated with ‘pretty’ and not ‘smart’ was thought provoking. Furthermore, discovering how successful Ranjitha has been in her work, as she’s supported by millions of dollars in research grants, was truly inspiring. Secondly, Gerd Berget (Oslo Metropolitan University) and Andrew MacFarlane (City, University of London) presented a combined talk on “Experimental Methods in IIR: Resolving the Tension between Rigour and Ethics in Studies Involving Users with Dyslexia”. Although mainly focused on the area of dyslexia, it stimulated reflection that was highly relevant for all researchers. For example, if you’re dealing with a vulnerable population who struggle to read or may have a shorter memory capacity, how do you ensure they fully understand what is being asked of them or that they remember their consent can be withdrawn if necessary? Thus, important aspects about experimentation with participants were clearly highlighted. Overall, I feel extremely privileged that after just two months of starting a PhD, I have already attended such a successful conference. I’d like to personally thank the co-chairs Martin Halvey, Leif Azzopardi, and Ian Ruthven, who did a great job to ensure everything ran smoothly, on time, and that every single person who attended enjoyed their time here. Being able to directly talk to people who came to share their work from such a wide variety of topics has taught me so much, allowed me to join their academic family, and inspired me with ideas for my own research. I am now sincerely looking forward to the next conference. For anyone who was unable to attend this year, I would like to finish by highly recommending perusing the official CHIIR’19 proceedings to see the high quality and variety of work that was exhibited, and to register for CHIIR 2020 in Vancouver. It’s a conference comprised of a good balance between researchers, students, and industry: there’s something for everyone. Having gained a First-Class Honours in Psychology at The Open University, Olivia Foulds is now a Computer and Information Science PhD student at The University of Strathclyde. Working under a studentship from BAE Systems, Olivia focuses on Agent-Human Collaboration in High Pressured and Complex Information Environments.